These nostalgia-inducing artisanal bars are more sophisticated versions of favorites from childhood. Think George Clooney vs. Liam Hemsworth. All this talk about January cleanses has candy on my mind. These awesome, nostalgia-inducing artisanal bars are more sophisticated versions of some of my favorites from childhood. Think George Clooney vs. Liam Hemsworth. Napa's awesome Woodhouse Chocolate coats super-crunchy, brown-sugary Golden Grahams cereal in a blend of creamy milk and dark chocolate. 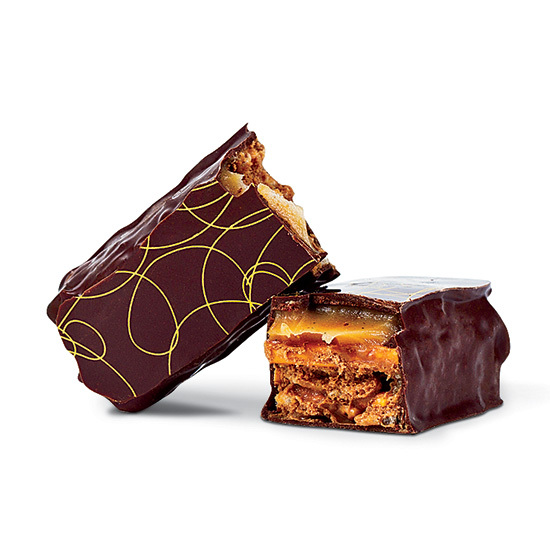 Mayana's chocolate-covered peanut butter, pretzel, salted caramel and crispy rice candy bar has an awesome creamy-crunchy texture. Grown Up Chocolate Company's Wonder Bar tastes sort of like a chocolate ice cream cone. It's filled with milk chocolate ganache, just a bit of hazelnut paste and crunchy, flaky bits of wafers. EHChocolatier makes decadent, all-natural chocolates in Somerville, Massachusetts, like this dark chocolate bar with coconut and almonds. French Broad Chocolates uses local malted barley from craft beer supplier Riverbend Malt House in Asheville, North Carolina, to create its malty dark chocolate bar.